A couple of days ago Twitter added the option to view a Google Map of geo-tagged Tweets. Now, in Twitter, if you see a small blue map marker beneath a Tweet you can hover over it with your mouse and see where the message was sent from. The map markers, at the moment, only appear next to Tweets sent from mobile phones and from people who have opted to share their location in their Twitter settings. This weekend Twitter have also produced a cool Google Map that shows some of the potential of geo-location in Twitter. Twitter@SxSW is a Google Maps mashup that shows the latest Tweets of Twitter employees on a map of Austin. 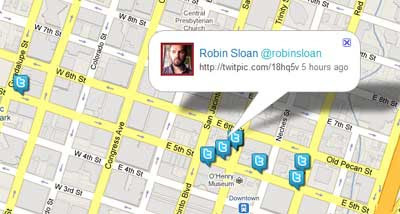 The idea behind the map seems to be to allow anyone to find and meet a Twitter employee. The map includes a 'To Meet' tab which lets you search for a Twitter employee within certain categories, e.g. partnering with Twitter, building tools with Twitter etc. Once you have found a Twitter employee, who you are interested in meeting, you can go back to the map view and find their latest Tweets. In this way you have a fairly good chance of being able to track them down and introduce yourself. This is a great idea for a large conference. I can see a lot of large companies being interested in this as a way of making their employees far more accessible to possible future customers and business partners. A " why did i not think of that " idea.